Chip maker NXP has teamed up with smart home specialist EnOcean at CES 2014 to show a solution that uses NFC to make it easy for homeowners to set up and add wireless lighting elements to their smart home network. 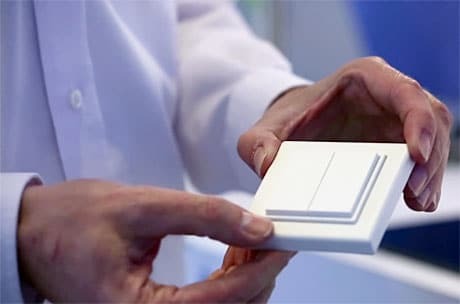 An energy harvesting light switch, developed by EnOcean, that operates without the need for either a battery or fixed wiring. The switch incorporates an NXP nTag NFC chip and an NXP JN5161 wireless microcontroller that implements the ZigBee Green Power feature. A gateway designed by NXP that plugs into a standard WiFi router and supports ZigBee Light Link, ZigBee Home Automation and JenNet-IP wireless communications, as well as NFC. A range of wireless colour LEDs and tunable white dimmable LED lamps that use “sensorless sensing” technology, first demonstrated by NXP at CES 2013. The setup enables EnOcean switches to be added to a home network by just tapping the switch to the gateway or a tablet computer, to collect network setup parameters. Individual lamps and lighting elements can then be connected to the network, again using NFC, and then turned on, off, up or down via the physical light switch or an Android smartphone. “The switch contains an NFC nTag device that stores the wireless network security information,” NXP told NFC World. “This security information is written into the nTag devices by tapping it on an NFC-enabled tablet or on the NFC-enabled gateway.